Re: ROCOR-A / ROCA: Who are they? What is their history? I have moved mention of this in-fighting into the Intra-TOC Polemics. If you want to read this discussion, but do not yet have access to the Intra-TOC Polemics Private Forum, please send me a Private message (PM). Testimonial about the reposed Fr Vsevolod Dutikow from a visitor to the US from the Russian Federation. It is interesting how an MP person was much taken by the Russian Empire atmosphere of this ROCA - Agafangel parish. So I settled down. But I needed to find a church to attend. I surfed the internet, and after several attempts I found that beautiful church in Astoria. It was the Church of the Holy Trinity. I loved this place from the very first step I made in. First of all, there was a community – I could feel it – those bonds of love between those people. Besides, it was like you got into XIX century. You see, in Russia Church at that time just had risen from the dead, but here you could feel this connecting thread of succession from ancestors. I was charmed by this church. I remember this feeling, when you stay 3.5 [ hours ]of vigil, and finally you literally forget you are in America, this feeling you are at home, and it was very strong! And then the Service ends, and you leave the church, and you return into the reality of foreign country, but not at once. First you feel the other air, then some weird looking car passes by, then you meet some bypassers, and they speak some other language, and finally you return into the reality that you are far away from home, that now YOU are foreigner. I was wormed [<- ! author means warmed ] by the love of those people, and by the lived reality of their community, that was incredible! That was marvelous! F. Vsevolod was the priest there. He got to know me, and I even started to sing in their choir. But I felt a little nervous about the fact it was Russian Church Abroad, not of Moscow Patriarchate – there was tension between two churches on that time. - Konstantin, I wanted to ask you for some time already, why do you come to our church? - Well, you know, – he answered – there in vicinity of the place where you live is the church of Moscow Patriarchate. It is the Monastery of St Mary of Egypt on the 3rd street on Manhattan. I don’t know why did he ask me this question, personally I believe it was the Grace of the Priesthood that guided him. God bless this marvelous priest, and in Your steadfast love give him eternal rest! -- Interesting to note the leeriness which the author of the above, the later MP deacon, Konstantin Seleznev, feels instinctively upon entering a staunch Rocor parish !! From this one sentence alone, the True Orthodox observer can understand VOLUMES about the deeply negative view of Rocor ingrained into members of the MP. Why did Fr Dutikow direct Konstantin to the MP outlet, Mercy House ? We will never know, as the venerable priest reposed in 2015. Perhaps he sensed that Konstantin was not really at ease in their midst. We don't even know in what year(s) this story took place. Why does the author not specify ? We can only glean that it was before the 2007 union neared fruition. If 2006, there would have been a thawing of feeling. So maybe this event described by Konstantin took place in 2005 or 2004 ? No way to tell. Nonetheless, it's also possible that Fr Dutikow had sharp antennae and did not trust his MP parishioner, however appreciative the latter was of Holy Trinity's atmosphere. "1993, the father of Vsevolod Dutikov was appointed rector of the Holy Trinity Church in Astoria. The decree on appointment came into force in the spring of 1994, by Easter, after the appeal of the church council sent to the First Hierarch of the Russian Church Abroad, His Eminence Metropolitan Vitaly (Ustinov). In the last decade of the last century, a new stream of immigration from the former Soviet republics poured into the United States. The Holy Trinity parish became more populous and younger. The new XXI century was marked by new unrest and new dramatic events. Their reason was the desire of a number of bishops to recklessly reunite with the Russian Orthodox Church of the Moscow Patriarchate, despite the fact that the latter flatly refused to fulfill the ROCA's long-standing demands to condemn Sergianism and withdraw from the ecumenical World Council of Churches. In May 2006, at the Fourth All-Diaspora Council of the ROCA in San Francisco, most delegates spoke out against hasty reunification. Nevertheless, on May 17, 2007 Metropolitan Laurus signed the Act of Canonical Communion with the Moscow Patriarchate, effectively subordinating it to the Russian Church Abroad. For opponents of a hasty and unconditional unification it was obvious that the Metropolitan could not resist the pressure exerted on him by political, not church forces. The reunion celebrated in Moscow was not complete. In July 2007, representatives of the clergy and laity gathered in the Holy Trinity Church, united by the desire to preserve the historical ROCOR. They established the Provisional Supreme Church Administration (PSEA), which was headed by Bishop Agafangel (Pashkovsky). The main task of the PSEA was to hold the 5th Council, which was to elect a new Synod. At the V All-Diaspora Council of the ROCA, held in November 2008 in New York, the Synod was elected and the First Hierarch - Metropolitan Agafangel. An important decision of the Synod was the glorification of the third First Hierarch of the ROCOR, Metropolitan Philaret. The resolution on glorification was read in the Holy Trinity Church, and a festive liturgy was held here, attended by clergymen of the revived ROCOR who came from all over the world. In June 2015, the Holy Trinity Parish marked its century. And in September of the same year, the parish suffered a heavy loss - while on vacation with the family, Father Vsevolod died suddenly from a heart attack. Metropolitan Agafangel, Archbishop Andronik and Bishop Gregory, Metropolitan of the Greek Orthodox Church in America, Metropolitan Demetrius, Metropolitan of the Greek Orthodox Church in America, arrived in Astoria to apostolate [ to serve the funeral ? ] to Astoria, Protopriest Grigory Kotlyarov and Pavel Ivashevich, ordinary clergymen of the ROCA and the Greek CPI, members of the ORYR and Parishioners of many parishes, who knew Vsevolod's father well.."
Fr Dutikow reposed September 5, 2015. "Dear Fr. Vsevolod was a cheerful, affable, open and energetic person. He had many friends and spiritual charges. Fr. 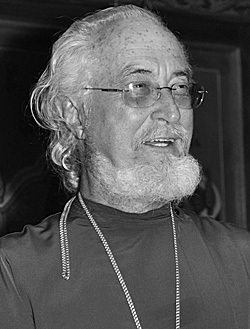 Vsevolod was devoted to children and actively participated in the St. George Pathfinders of America scouting organization and was its spiritual father at one time. He also had the obedience to accompany the Hodegetria (“She who shows the way”) of the Russian Diaspora, the Kursk Root Icon of the Mother of God, in its travels. With it, he visited many places, including Canada and South America, where he made many new friends. Dear Fr. Vsevolod dedicated many years of his life to the Holy Trinity parish in Astoria, where he was once the church warden, and then later, after becoming a priest, he became its rector and spiritual leader. As a result of the efforts of Fr. Vsevolod, renovations of the church were completed in time for the joyous celebration of the 100th anniversary of the parish, which took place in June of this year." Unfortunately, today this key parish is in the hands of the rebel faction, led by the above former Archbishop Andronik and others. Regarding the Roca.org website for Orthodox America mentioned above, it does NOT seem to be working anymore. At least, I received an error note when I clicked on a link to access an article yesterday.